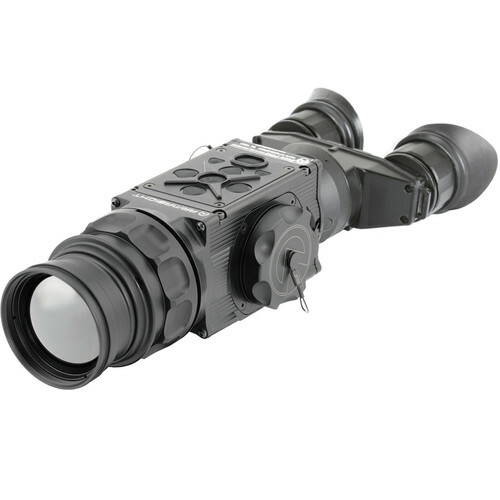 See through smoke, fog, and dust, day or night, with the Command Pro 640 2-16x50 Thermal Bi-Ocular from Armasight by Flir. Its FLIR Tau 2 uncooled microbolometer detects long-wave infrared and allows you to see heat emanating from humans, animals, and jet or combustion engines. It also offers visibility in total darkness and through fog, smoke, foliage, and dust. The sensor has resolution of 640x512, 17µm pixel size, and refresh rate of 30 Hz. The optical system features a 50mm f/1.4 germanium lens with 1.8x magnification with the default NTSC format and digital zoom of up to 8x. To help you with aiming and fast target acquisition, this device offers a multi-color digital reticle. The built-in AMOLED SVGA 060 video display features 800x600-pixel resolution and allows several viewing palettes: White Hot, Black Hot, Sepia, Fusion, Rainbow, and Rain. For documenting your observations, the scope is capable of relaying videos through a video-out port in NTSC and PAL formats. Use the 9-pin connector cable for updating the device software and to relay videos. Additionally, the operating system allows you to enhance video outputs with a selection of imaging filter algorithms. This imager also features a Bluetooth compatibility, wireless remote control, digital compass, digital inclinometer, and battery status indicator. To withstand rigors of the battlefield, this device can operate in extreme temperatures and has a durable waterproof and fog-resistant aluminum housing. In addition to handheld operation, you can mount it on Picatinny or Weaver-style rails via the included mount. For further information contact the Office of Defense Trade Controls and/or the U.S. Department of Commerce.